When it was rumored that Dan "I Love to Assemble a Fantasy Football Team" Snyder was moving money around after talking to Albert Haynesworth's agent last weekend, I figured we'd seen the last of Big Albert in a Titans' uniform. I've heard a lot of debate over the past couple of days in various places (not just on the radio) about why the Titans won't open the checkbook and just pay players. Considering that Albert wanted to be the highest paid defensive player in the league when he has yet to play an entire season, I can see why the Titans were hesitant. And, the Titans did deal with him honorably, living up to their side of the bargain and not slapping the franchise tag back on him this year after he met certain goals. Albert will be missed. I think a lot more than some of the people I've talked to over the last couple of days think. A lot of people point to the Pittsburgh game that Big Al was out and several guys stepped up and delivered without him. Yes, but the Pittsburgh offensive line is their big weakness. And the guys were fired up for that game. It's easy to be the man when you're stepping in for someone else. Now they will be the main focus and we'll see what happens. I hope it works...but I am going to have to wait and see. And I guess on the positive side, I should be glad that Albert went to my other favorite team. But given the track record of the Redskins of assembling great fantasy teams that don't gel on the field, I'm not holding my breath or pre-ordering my Super Bowl tickets yet. I wonder if the Titans play the Redskins this year. That could be interesting. And can we please sign Kerry Collins now? Battlestar Galactica: "No Exit," "Deadlock"
After the sheer greatness that was the mutiny two-parter, I guess there had to be a bit of a letdown. It's not that these episodes were bad, but compared to scenes of Adama taking back the ship and Roslin swearing unholy vengeance on Zarak, it just wasn't the same. But yet it was just as rewarding. It took me a long time to get my head wrapped around "No Exit." Essentially it's a huge info-dump of an episode and one designed to tie up some loose ends. It also seems to be setting up things for "Caprica," I think. But we'll have to wait until the pilot comes out on DVD before we jump to any more conclusions. Ron Moore gave us a lot to digest in an hour--from the origins of the Cylons to how resurrection came about to the heirarchy of things. And Moore has admitted that they screwed up the continuity by not being able to count and he's also said that we won't see or hear much more about Daniel the rest of the run. Which is kind of disappointing or else it's a huge red herring because Daniel does have some huge impact on the final revelations to come (best theoery I've heard is Starbuck is a child of Daniel). Again, maybe it's all setting things up for "Caprica" and we'll learn more about Daniel there. But I don't think it's likely. It also put some interesting new spins on certain relationships like Tigh and Caprica Six. It's one of those moments where you suddenly re-evaluate everything from the series to that point and then do a mental cringe. Kind of like Leia kissing Luke in "Empire Strikes Back." You can kind of go--ewww! in retrospect. Which brings us to the next episode where the final five are reunited and Ellen returns to the fleet. The reunion of Tigh and Ellen was everything it needed to be and then some. And then to see Ellen shift back to her manipulative self, trying to manuever things to hurt Tigh just as she'd been hurt was wonderful. The dynamic of Tigh, Caprica Six and Ellen was wonderful and I found it a bit odd that Ellen had to play a Cyrano of sorts to get Tigh to share his feelings for Caprica Six. I think Tigh does love Caprica Six, but will they stay together now that she's lost the baby? And what impact will that have on her and the series as we move into the final episodes? It's easy to see how much Tigh cares, but could this drive them apart? Certainly we know that most couples outside of Roslin and Bill Adama can't be happy for more than four episodes at a time on this show, if that many. And then there's Baltar. Batlar who fled at the first sign of trouble from his crazy cult and now returns to find he's not the man in charge any more. And who decides it's time to take back power. I'm not sure what to make of this plotline really. I've both liked and disliked it all year. I find it fascinating to see Baltar in exile or on the run, but I don't feel like that's fully been explored. It seems like a lot of people have forgotten what he was accused of and/or have forgiven him far too easily or quickly. In the day and age where we still bring up the Nicole Simposon murders when we mention O.J. Simpson, I find it strange that no one ever brings up his time as president and his list of accused crimes to Baltar. Especially the thugs in the down below areas who come and take the food. And I'm not sure giving the crazy cult guns in the best idea. It's interesting to see Baltar trying to re-establish some kind of order since he's the one who started the whole process that has created the chaos we see now. Could we finally see Baltar grow beyond the man who follows his own impulse for self-preservation and self-fulfillment? Or is that too much for the final episodes to really delve into. We've only got five hours left and a lot of other big questions. I have a feeling this one will be glossed over in the final run. And maybe that's for the best. Beyond that, I can still see why it came second. Last week, it was all about meeting Echo and getting an idea of what this universe entails. This week it was about opening up the universe a bit more and giving us a few questions. We've found out that the default setting of the dolls is to be childlike and without the ability to defend themselves. Apparently, they tried having a default setting with defense abilities and it turned out negative. That's a story I'd love to know more about, but I suspect it may be related to Alpha somehow. Which brings up a bigger story arc. I'm wondering if Joss is structure the show along the lines of "Buffy" with a single threat to drive the overall narrative. If so, that could be Alpha for this season. Who is Alpha and what is his or her interest in Echo? I think it's safe to assume Alpha wasn't the guy who hired Echo out for his playing of "The Most Dangerous Game." It seems like they'd recognize him. And what is Alpha's agenda? If we're to assume that he or she sent the photo to Ballard, why would he do it? Does he or she want the program exposed and why? And if Alpha a programmed personality or a combination of several that leaked through? This is why I watch shows by Joss Whedon. Those kind of potential stories and arcs. And the characters. So far, we don't know a lot about them, but I think it's wise to have a show that gets us to know more about Boyd Langdon. On a show where our main character changes each week, he's the one who we'll look to as an audience to figure out how to react. It's almost like the role of a companion when a new Doctor is introduced on "Doctor Who." We learn about the new Doctor by how the established character reacts to him. And I think Boyd could eventually become disillusioned with the process or pursuaded to help Echo recover whatever these memories are that are bleeding through. He clearly has a backdoor into her personality and can quickly establish trust no matter what imprint she has. How far could this go? And could it eventually be used to hide things from being erased? Next time you wonder who to blame for global warming, just think of me. According to Australian senator Steve Fielding, my being divorced and living alone means I'm sending the planet to hell in a handbasket at an alarming rate. "Staying married is better for the planet because divorce leads the newly single to live more wasteful lifestyles, an Australian lawmaker said Tuesday. Senator Steve Fielding told a Senate hearing in the Australian capital Canberra that divorce only made climate change worse. Well, I certainly had no idea I was living a "resources-inefficent lifestyle." If only I'd been aware of the damage I'm causing the world when I was going through my divorce. I guess you'll just have to add my bigger than it should be carbon footprint to the laundry list of things I'll have to answer for when the roll is called up yonder. On the other hand, I would also say that being a single person you can live a more "resources-efficient lifestyle." For one thing, there's no constant battle between two people in the winter or summer over what the best temperature for the house is. And with only one person in the house, the instances of opening the fridge and aimlessly staring into it looking for something to eat are reduced. Or better yet--I don't have to open it up, look for what I want and then wonder out loud if the other person has eaten all the moose tracks ice cream. See, I'm saving the planet right there! Of course, there was also the report that having more than two children also dangerously increases your carbon footprint. So it seems to me that the best thing to do is get married as soon as I can, have two kids and stop destroying the planet. I can think of a lot of great reasons to get married. Unfortunately, none of them have to do with my "global footprint" or my "resource-inefficient lifestyle." I'm a bit behind on the TV Round-Ups, so I thought I'd do some short, sweet and to the point posts about some of the shows I usually comment on and some that I don't. Not a show I usually comment on simply because it's pretty much the same formula every week. Patient comes in with some strange illness, House and company try to figure it out and usually come upon some miracle diagnosis in the last five minutes. Throw in a subplot about how House is a jerk or some team member has a connection to the patient of the week and you've pretty much got most episodes of this show. So why do I watch? you ask. Simply put, Hugh Laurie as the title character. And yet, in recent weeks I've found myself growing less and less fond of the show. It kind of reached a culmination with this week's episode that felt like a greatest hits. So, House has pain in his leg and finds that by moving from vicadin to methadone, the pain goes away. It also makes him a nicer person instead of the gruff, grumpy guy he usually is--to the point that he makes the patient of the week worse. In the end, House decides to call off his meth treatment and live with the pain because he's a better doctor only on vicadin and pain. Which it's an interesting plotline and would be some nice character development if it weren't for the fact that this show has burned us so many times in the past by having potential growing moments for House and the rest of the cast only to toss them aside once the currently storyline has run its course. For example, Tritter. Or Amber from last year. So, while I am glad House didn't string out the plot longer, I'm still left feeling like we've learned nothing really new about the character. Don't get me wrong--Hugh Laurie is still a great actor and would make a superlative Doctor (as in "Doctor Who.") But I'm finding the series less and less enjoyable these days. Maybe it's worn out the welcome or maybe it needs to play with the formula. Day seven got off to a slow start, but somewhere in the last few weeks it's really picked up steam. I've not seen Monday's new episode yet (it's on the DVR) but the last two hours have felt like vintage "24." Now that we've got rid of the First Gentleman in peril plot (the Kim Bauer vs a cougar of this year, by far), suddenly the show has found its legs and is really clicking on all cylinders. I wouldn't go as far as Robert Bianco did and delcare it one of the two best shows on TV right now (sorry, but "Battlestar Galactica" is up there in the top spot right now), but it's still entertaining and fun. And it's actually asking some really good questions about the toll this is taking on Jack and how he's perceived by others. It's interesting to watch Jack make choices that completely make sense in the plot but when viewed outside of the moment seem completely insane. Jack's attitude of the ends justify the means goes right in the face of every policy most other characters have on this show, but it's interesting to see how a lot of them are grateful to have Jack around to do these things. The biggest example is the new president, who is willing to look past Jack's sins and being up before Congress to answer for his alleged abuses of power and authority when her husband is being held prisoner. She turns him loose...possibly because she can wash her hands of him if whatever he's doing blows up in his face. If she'd sent the FBI or Secret Service, it could look bad. Send Jack Bauer and she can say she asked him to help but never intended it to go as far as it did. So, they're back on the island. I loved last Wednesday's episode where we got a whole lot of answers and about fifteen thousand more questions. Having an end-line for the series has helped his show a lot and I feel sorry for those who tuned out early. You're missing some damn good storytelling. So many questions that I can only assume we'll have answered in the weeks to come including how did Hurley get out of jail, where is Aaron, why is Ben beaten up (I have a bad feeling it will be due to killing Penny), who is the woman with Sayid, and is there some significance to how landed where on the island? Also, what time period are our heroes in now? Are they in the past, present or future? I did like Locke's final note to Jack, though part of me wondered if we'd see it in the episode. It seemed like one of those things that you could make a long-term mystery. But then again, it wouldn't be all that satisfying to wait six weeks to find out that Locke wished Jack had more faith. If it'd been "neener, neener I told you so," that might have been worth it. I've been excited about "Dollhouse" for a while now. Probably ever since I heard that Joss Whedon had been lured back to television, a playground that is far too empty without him. And to hear that he was teaming up with Eliza Dushku for a new series and was inviting a lot of his fellow Mutant Enemy friends to come and play in the sandbox...well, you can see why my expectation level was pretty high. I say this because as I was watching this first episode, I found myself wanting to love "Dollhouse" a lot more than I did. It's not to say it's bad. Anything by Joss beats about 90% of everything else out there on TV, but as the episode closed, I still felt like something essentially Whedon-esque was missing here. And as I've thought about it, I think I've hit on it--the quotable dialogue. It's a Whedon show, so that means I will watch every episode. I have to recall that "Buffy" and "Angel" while they had solid starts, didn't exactly launch out of the gate like gangbusters. Neither did "Firefly" for that matter, but I will admit I loved "Firefly" more after one episode than I love "Dollhouse." Right now, "Dollhouse" is a show I really like and want to see more. Which I guess is what you want with a pilot. I'm also willing to give the show a bit of a pass given how many times they had to tinker with the pilot. Hopefully the next few episodes will settle down and Joss can start to tell the stories he wants to in the way he wants to. "The Oath" & "Blood on the Scales"
Like the final season of "The Shield," the final season of "Battlestar Galactica" is going out with a bang. Just as having the end in sight freed "The Shield" to allow them to take the gloves off and really start delivering on several seasons' worth of build-up and tension, so does having the end in sight do that for "Galactica." This is a story that's been slowly building and bubbling since the first days of the series. And now, with the fleet having lost hope of a home in Earth and without Roslin there to provide some kind of moral compass leadership for the last survivors of humanity, things become so frayed that a full-scale mutiny is not only possible but almost expected. Tom Zarak has waited in the wings long enough and he finally sees his chance to slip in and make a last, desparate grab for power. He finds the ally he's always wanted in Gaeta (he's tried many times with Lee Adama, only to see him go scurrying back to Roslin's camp) and he's got the issue that he thinks he can pound home. The concept of putting Cyclon technology on all the ships of the fleet must be terrifying to him--and it's a completely understandable fear. And that's the thing about this show. While we may be rooting for Adama, Roslin and company to take the fleet back, we still know deep down that Zarak kind of has a point. In the miniseries, Adama wouldn't network computers together to keep the Cylons from gaining control. Now he wants the ships to trust them enough to install their technology. It's a big leap of trust to go from supporting each other against Cavil and his group of Cylons to letting them put their technology into the very things that sustain our every day lives. And as you watch things unfold in the first half, you can see Zarak has a point. It's only in the second half that he goes too far in trying to drive home his vision of the fleet. Zarak finds it's easier to be the second-string guy than the guy out there leading. Everyone loves you as the back-up but once you're thrust into the spotlight, the same people who loved you before will now turn on you. (Listen to any sports call-in show in the known world for proof). Zarak figures that once he takes power, everyone will fall in line with him. And then, the Quorum doesn't. So instead of taking the road Roslin would and trying to pursuade them of the strength of his position, he has them all shot and killed. At that point, any sympathy I had for Zarak evaporated. And yet it was such a jaw-dropping moment that you couldn't look away. And you realized just how duplicitious Zarak is and the only thing he cares about is himself. He may claim a high road and a moral superiority, but he's not. And it's fascinating to see Gaeta's reaction to the news and realize that maybe he's back the wrong horse in this race. Meanwhile, Adama faces the task of taking back the fleet and trying to rebuild it. It certainly won't be easy to trust anyone who mutineed against him, but he may not have a choice. At this point, his pool of capable officers and military people has dwindled down to next to nothing. And with Tyrol seeing that crack in the FTL drive, I am betting that puts added pressure on Galactica to find a new home and soon...before they're stuck in space forever. Just like the final episodes of "The Shield," you can feel the tension getting higher every week. The noose is closing and there aren't many options yet. And that's even before Cavil and his group of Cylons have shown up. You can bet they're out there and you can bet they'll be back. It's episodes like these that are bittersweet for "Galatica." They're so exemplary that you can't help but with the show could go on at this level of brilliance forever. But then you realize that part of what makes it work is having the end in sight and being able to make some of the choices made here. Killing of Zarak and Gaeta, as well as a bunch of others from the mutiny could only work with the series being in its final episodes. And yet, I can't help but love the series that much more and be left wanting more and wanting it now. Heroes: "Clear and Present Danger"
At the risk of sounding like a hypocrite, I wish we'd had a few more indications that Peter can't fly and can only absorb one power at a time BEFORE it became a major plot point in the final few moments. I realize we got a few hints, most notably Peter's unwillingness to tell Nathan just how far his powers extend now. But it still felt a bit forced and intended to add to the drama of the final moments by having Peter only able to draw upon one power at a time and not carry them all around like Sylar does. (And how long before those two cross paths and Peter can carry all the powers he wants again. I'm guessing, not long). The problem with "Heroes" is they keep promising it's going to get better and it just doesn't. This episode wasn't terrible, but it wasn't particularily good either. And they're still not learning from their previous mistakes. A lot of it comes from the fact that it's hard to care much about the fate of the characters since they change motivations every other scene. Nathan's gone back and forth so many times now that it's almost some kind of joke and I would not be shocked to see that he's somehow a double agent, looking to expose the company, the government or somebody for these crimes. And for HRG to suddenly go back to his season one status. It seems like the writers are trying to remind us of the glory days when everyone loved the show by just hitting a reset button instead of earning it by actually telling a story or doing some character development that isn't necessitated by the plot twist they want to introduce in the next two to three minutes. I can see some improvement in the show, but it's not enough to really make me embrace it and love it again. But yet, I keep watching. I think I'm worried they'll come take away my geek card, thus now allowing me to continue savoring "Lost" and "Battletar Galactica" if I turn my back on "Heroes." 24: Day Seven, 1 p.m. - 3 p.m. Watching the first seven hours of day seven, I can't help but wonder at what point did they shut down production for the writer's strike? And when is the magic episode they shut down production so they could take a long, hard look at things and try to come up with a better, more coherent storyline that what we've seen unfolding so far. This week is hour eight, so we maybe once we get through the pre-strike episodes things will take a dramatic up-turn. In a lot of ways, I felt like this episode was written to start closing things down in case they could only do eight hours in season seven. A lot of plots have hit a crossroads, but the big conflict over the device that controls every defense computer on the planet is gone. And we've got Mobatu back to safety and on Jack's side. (I still admit I fall on the floor laughing when we see the scene of his wife saying they should trust Jack as he has no reason to life simply because it's so absurd that she would willingly believe the guy who kidnapped her and tried to kill them with a lethal gas in their safe room...all within the span of 30 or so minutes). At least we're done (hopefully) with the First Gentleman plotline of trying to clear his son's name. Or maybe not. This seems like something that will have to come up again just as we're forgetting about it. Of course, part of the fun of "24" is you have to accept each crazy twist as it comes up and not really question the logic of it. I think part of what's dragging it down a bit this year is the scenes without familar faces aren't as interesting. Part of that is the characters are just carbon copies of other familar faces we've come to know and love. And part of it is that we've not had any time to get invested in them. I am not compelled that the head of the FBI was once involved with Agent Walker, who he thinks is dead. I don't care about Jeanne Garofolo's snarky character, nor do I feel much when she connects with guy who vents the gas to buy more time to save his co-workers. If you insert Chloe in there, it works better becuase we know and like Chloe (well, most of us....I still find her annoying and overused). It's why I find myself wanting to know more about how and why Tony went bad more than I care about who the new mole at the FBI is. Tony clearly has some anger here and I'd love to see some exploration of that. We've had some, but it feels like we're only scratching the surface here. I used to think that kicking drills were my least training part of swimming. But I've found something new that may tie, if not replace it--swimming with a parachute. You've got this piece of canvas, attached to a lead and that is attached to a belt/harness you can wear. You swim out and the parachute "inflates" in the water, creating greater resistance as you attempt to swim down through the water. It's almost as much fun as it sounds. I will say this--it really will give you a good shoulder and arms workout. The legs may get a good one as well, though mine try to find a way to not get tangled in the lead. 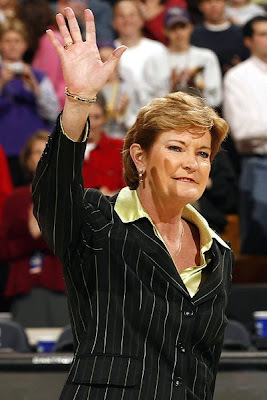 Congratulations to Pat Summitt on winning her 100th game tonight. I was disappointed she didn't get the win Monday night, but I knew it wouldn't be long. And she won it on the home turf of the Summitt. And she beat the stuffing out of Georgia, which I loved. Thank you Pat for the great wins, the memories and, most of all, being a great representative of the University of Tennessee and our great state. Now, let's focus on getting national title number nine! When you take certain workout classes, you often get asked if you're training for some event or another. (Right now, the popular response is the Country Music Marathon for many...not so much for me). My usual response is, "No, unless you count dessert." It's not that I don't want to train for a particular goal, mind you. I just am not motivated enough to make myself want to run 13.1 or 26.2 miles on a Saturday morning in April. It's not that I dislike running, but there are other forms of exercise I enjoy more. That said, I do like to push myself every once in a while to a new limit or test myself. It's good to see how far I've come and figure out where I need more work. It gives me a new goal and something to work for--beyond that piece of chocolate cake or a shake from Sonic. With that in mind, I decided to start participating in a Master's Swim Team this year. I'd seen them at other Y's I've been a member of, but I'd never joined. But I decided I'd reached a point where it'd be nice to work a bit on my technique and have some kind of structure to my swim workout a few times a week. Some people call it crazy, I call it kind of fun. Oh yeah, and I am supposed to learn how to kick turn which is a skill that has eluded me. I've tried to teach myself or replicate it based on observing others do it but I generally end up with a nose full of water, sputtering and coughing. The class is a nice group of people who want to get better but aren't over the top gung-ho about it. Now comes word that the Y is going to offer an indoor triathalon in April. And I have to admit I am considering giving it a try. It would be 13 miles of bike riding, 500 meters swimming and then a three-mile run. The only part I am not confident is the three-mile run part, but I've been trying a treadmill class once a week to add some variety (and new ways to be sore) to my routine and I think I can handle it. So, I'm thinking of giving it a try in a couple of weeks just to get a gauge of where I am physical fitness-wise.